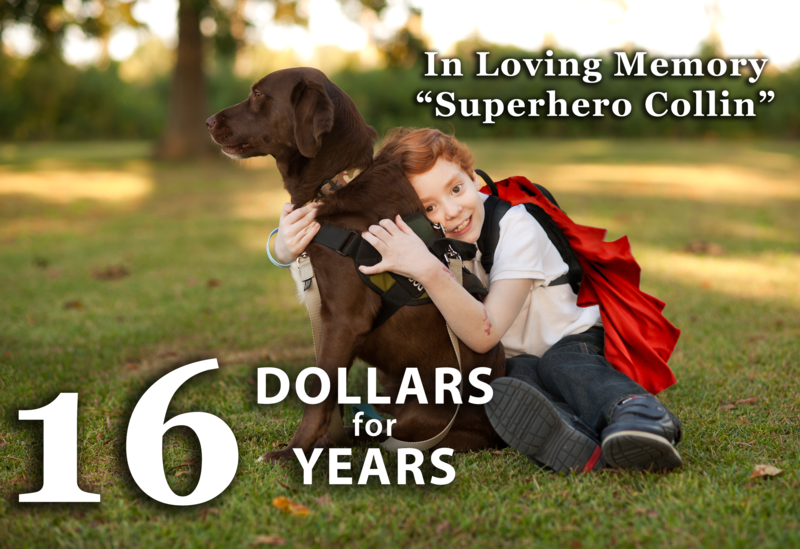 Donate $16 in memory of "Superhero Collin's" 16th birthday. Please join us celebrating Collin’s life on his 16th birthday and donate $16 to NMO research. A rare autoimmune disease called neuromyelitis optica (NMO) took Collin away from us when he was 9 years old in 2012. For what would have been his 16th birthday, our wish is to help other NMO patients find a cure. Today, life-saving medical advances are in progress and your support can make an impact. Collin might still be alive today if treatment options were identified earlier and clinical trials were in progress like they are today. The foundation of our choice is The Guthy-Jackson Charitable Foundation, a nonprofit family foundation spearheading advances in research, which has aided in securing the only clinical trials to date, and that helped rewrite the book on how to diagnose this life-threatening disease. NMO is most commonly misdiagnosed as multiple sclerosis (MS). 100 percent of your donation goes to research. Please donate now and help us keep Collin’s memory alive. The Guthy-Jackson Research Foundation, Inc. The Guthy-Jackson Charitable Foundation (GJCF) has created the public entity named The Guthy-Jackson Research Foundation, Inc. (GJRFI), a nonprofit public benefit corporation. While GJCF remains a private charitable foundation, the public GJRFI expands avenues for funding participation by allowing more corporations and organizations to donate to NMO research. This includes donations from public, private and government organizations, as well as donations from fundraising events, families, friends and individuals like you. While all donations are now directed to GJRFI, our focus remains the same: funding research to find a cure for NMO. As always, 100 percent of all donations are appropriated directly to NMO research. The Guthy-Jackson Research Foundation, Inc. does not allocate any donated monies to administrative support of the Foundation. Your gift directly supports the innovative scientific research of scientists who are working to find solutions for Neuromyelitis Optica (NMO) Spectrum Disease. Once your contribution has been processed you will receive a thank you letter in the mail that you can use as a tax receipt. The Guthy-Jackson Research Foundation, Inc. for NMO is a non-profit 501(c)(3) organization Tax ID # 47-2186708. Please consult your tax advisor if you are placing a donation from a country outside of the United States. PayPal fee is paid back to the research budget from the operations budget.